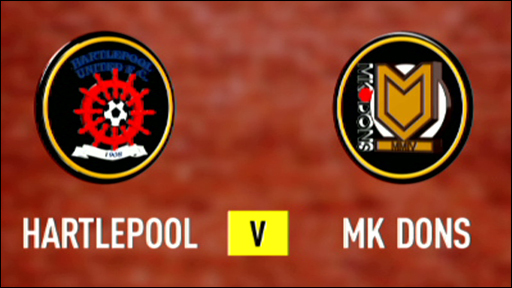 Hartlepool suffered their biggest home defeat since May 1994 as visitors MK Dons struck five goals without reply. The visitors took the lead after four minutes when Jermaine Easter broke the offside trap and slotted in. A Gary Liddle own-goal doubled their lead seven minutes later and Peter Leven added a third after the break. Substitute Sam Baldock chipped in the Dons' fourth with practically his first touch before Jason Puncheon's low drive completed the rout. "That's been something that has been brewing over the last two months. Today was an exceptional performance. "This is a place where teams don't like to come and play. They don't concede many goals here and they don't lose many games. "We walked off and there were 100 of their fans clapping us off. They said it was the best performance they had seen at this ground." 85:13 Corner taken by Ritchie Humphreys from the right by-line, clearance made by Dean Lewington. 83:39 Unfair challenge on Dean Lewington by Andy Monkhouse results in a free kick. Willy Gueret takes the free kick. 83:39 Booking Andy Monkhouse receives a caution for unsporting behaviour. 81:47 The assist for the goal came from Aaron Wilbraham. 81:47 GOAL - Jason Puncheon:Hartlepool 0 - 5 MK Dons Goal scored by Jason Puncheon from just outside the penalty box to the bottom right corner of the goal. Hartlepool 0-5 Milton Keynes Dons. 76:21 Assist on the goal came from Andros Townsend. 76:21 GOAL - Sam Baldock:Hartlepool 0 - 4 MK Dons Sam Baldock gets on the score sheet with a goal from inside the box to the bottom right corner of the goal. Hartlepool 0-4 Milton Keynes Dons. 74:34 Substitution (Milton Keynes Dons) makes a substitution, with Sam Baldock coming on for Jermaine Easter. 73:28 Joe Gamble takes the free kick. 73:28 Booking Jermaine Easter shown a yellow card. 72:31 Free kick awarded for a foul by Jermaine Easter on Neil Austin. 71:49 Booking Jason Puncheon is booked. 71:39 Free kick awarded for a foul by Jason Puncheon on Antony Sweeney. Indirect free kick taken by Scott Flinders. 70:23 The ball is delivered by Andros Townsend, save made by Scott Flinders. 68:25 Substitution Peter Leven leaves the field to be replaced by Mark Randall. 68:25 Booking The referee shows Gary Liddle a yellow card. 67:50 Gary Liddle gives away a free kick for an unfair challenge on Aaron Wilbraham. Jason Puncheon restarts play with the free kick. 62:20 Substitution Colin Larkin is brought on as a substitute for Ritchie Jones. 59:48 The ball is delivered by Andros Townsend. 58:55 Substitution Luke Chadwick leaves the field to be replaced by Andros Townsend. 55:15 Corner from the left by-line taken by Ritchie Jones, clearance by Peter Leven. 55:10 Neil Austin crosses the ball, clearance made by David McCracken. 53:09 The assist for the goal came from Luke Chadwick. 53:09 GOAL - Peter Leven:Hartlepool 0 - 3 MK Dons A goal is scored by Peter Leven from deep inside the penalty box to the bottom left corner of the goal. Hartlepool 0-3 Milton Keynes Dons. Correction - 51:37 Free kick awarded for an unfair challenge on Jermaine Easter by Andy Monkhouse. Willy Gueret takes the free kick. 51:37 Unfair challenge on Jermaine Easter by Andy Monkhouse results in a free kick. Indirect free kick taken by Willy Gueret. Correction - 49:43 Adam Boyd is caught offside. Free kick taken by Willy Gueret. 49:43 The referee blows for offside against Adam Boyd. Willy Gueret restarts play with the free kick. 47:58 Foul by Jason Puncheon on Neil Austin, free kick awarded. Ritchie Humphreys takes the free kick. 45:00+2:06 The whistle is blown to end the first half. 45:00+0:29 Free kick awarded for an unfair challenge on Gary Liddle by Aaron Wilbraham. Scott Flinders takes the free kick. 45:00+0:11 The assistant referee flags for offside against Denis Behan. Willy Gueret takes the indirect free kick. 44:45 Peter Leven challenges Joe Gamble unfairly and gives away a free kick. Indirect free kick taken by Joe Gamble. 41:42 The official flags Aaron Wilbraham offside. Free kick taken by Scott Flinders. 39:54 Free kick awarded for an unfair challenge on Joe Gamble by Peter Leven. Joe Gamble takes the free kick. 38:52 Substitution (Hartlepool) makes a substitution, with Denis Behan coming on for Armann Bjornsson. 36:02 Foul by Aaron Wilbraham on Ben Clark, free kick awarded. Free kick taken by Ben Clark. 35:30 Adam Boyd fouled by David McCracken, the ref awards a free kick. Antony Sweeney takes the indirect free kick. 35:18 The ball is delivered by Dean Lewington, clearance by Neil Austin. 30:27 Corner taken by Jason Puncheon from the right by-line, David McCracken produces a left-footed shot from inside the area that goes over the bar. 29:18 Free kick awarded for a foul by Ritchie Jones on Dan Woodards. Willy Gueret restarts play with the free kick. 28:15 The assistant referee signals for offside against Armann Bjornsson. Free kick taken by David McCracken. Inswinging corner taken from the right by-line by Ritchie Humphreys. 27:03 The assistant referee flags for offside against Luke Chadwick. Antony Sweeney takes the free kick. Correction - 26:05 Free kick awarded for a foul by Ben Clark on Aaron Wilbraham. Indirect free kick taken by Peter Leven. 26:05 Foul by Ben Clark on Aaron Wilbraham, free kick awarded. Willy Gueret takes the free kick. 25:14 Jermaine Easter handles the ball and concedes a free kick. Scott Flinders restarts play with the free kick. 24:20 David McCracken concedes a free kick for a foul on Adam Boyd. Ben Clark takes the free kick. 23:38 Armann Bjornsson is caught offside. Free kick taken by Willy Gueret. 22:25 Corner taken by Ritchie Humphreys from the right by-line. 21:40 GOAL - Gary Liddle:Hartlepool 0 - 2 MK Dons An own goal is scored by Gary Liddle. Hartlepool 0-2 Milton Keynes Dons. 18:27 Jermaine Easter has an effort at goal from just inside the box that misses to the right of the target. 14:27 Headed effort from close range by Ritchie Jones goes wide left of the target. 13:33 Free kick awarded for an unfair challenge on Adam Boyd by Stephen Gleeson. Ritchie Jones takes the free kick. 10:42 Inswinging corner taken by Jason Puncheon from the right by-line, Dean Lewington takes a shot. Save by Scott Flinders. 10:14 Inswinging corner taken by Luke Chadwick, clearance by Gary Liddle. 9:22 Corner taken short by Ritchie Jones. 8:51 Corner taken right-footed by Adam Boyd, save by Willy Gueret. 3:54 GOAL - Jermaine Easter:Hartlepool 0 - 1 MK Dons Jermaine Easter fires in a goal from close range low into the middle of the goal. Hartlepool 0-1 Milton Keynes Dons. 3:13 Corner taken left-footed by Jason Puncheon. 2:07 Corner taken right-footed by Ritchie Humphreys, clearance by David McCracken.